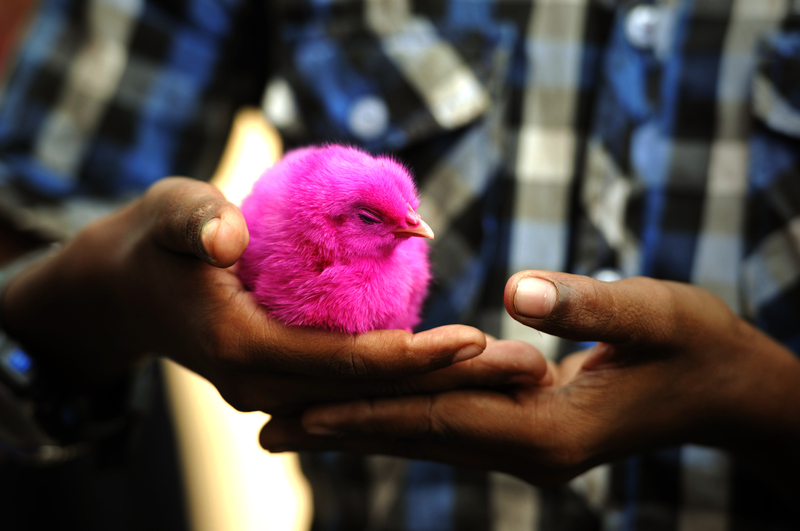 Pink chicken, India is submitted to ‘Opposites’ on National Geographic. Kristian Bertel has contributed to the National Geographic Your Shot with an assignment called ‘Opposites’. Curated by David Y. Lee, a producer at Nat Geo Your Shot he wants to see a successful photo that will have at least two different elements to illustrate the theme of opposites and to see juxtaposition, whether it is a visible difference in tones, color and light, to an Intimate portrait. We should be creative and think outside of the box while looking for concepts that visually express the theme of this assignment. We should look around our homes and communities to discover the essence of opposites in our everyday lives. As David is saying it: ”- Op·po·site (noun): a person or thing that is totally different from or the reverse of someone or something else. Life is a combination of mixed emotions. We are always on a roller coaster ride of positives and negatives, yes and no, similar and different. This combination of opposites keeps life from being monotonous and thereby more interesting. For this Your Shot assignment, I want you to share scenes and moments that visually define the concept of opposites” he says. We like to look at photographs of opposites because they are objects that we do not expect to see together. Opposites give us visual contrast and when two objects contrast in a big way, they give our viewer something to think about. Just about everywhere we look in nature there are opposites, or at the very least things that can be represented as opposites. One of the things a photographer can look for when talking about opposites in photography are colors. The color wheel is a simple tool that can help you understand the relationship between colors, but it can also be used to help you create photographic opposites. Colors that appear opposite one another on the color wheel are called ‘Complementary colors’ but you can also think of them as literal opposites. The opposite of blue is orange, the opposite of a green is a red, and the opposite of purple is yellow. In the submitted photograph a painted chicken is shown in the hands of a boy in Mumbai. Painted and colored animals are a common sight in India, especially during the color festival of Holi. One of the most exuberant festivals in North India, where Hindus celebrate the beginning of spring by throwing colored water and Gulal powder at anyone within range. Holi is a Hindu spring festival, originating from India, celebrated predominantly in India but has also spread to many other Western countries, also known as the Festival of colors or the Festival of love. The festival signifies the victory of good over evil, the arrival of spring, end of winter and for many a festive day to meet others, play and laugh, forget and forgive and repair broken relationships.